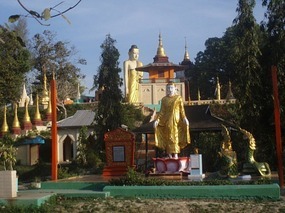 Pathein is a port city with a 2004 population estimated at 315,600, and the capital of the Ayeyarwady Region, Burma. It lies on the Pathein River (Bassein), which is a western branch of the Irrawaddy River. Pathein is the fourth largest city of Burma (Myanmar), situated 190 kilometres (120 mi) west of Yangon.